Concept training - very capacious, here it is possible to include everything, as to training and education of a puppy. Training of a puppy begins at once as you have brought it home. At once be defined, where there will be "place" of a dog where you will feed him, make the feeding schedule. Important point in training of puppies is persistence, necessarily achieve command performance, how many time it would not occupy. At the initial stage training of a puppy should look as game, for each executed command encourage a puppy with any delicacy. The violence and negative emotions are not admissible, you can injure mentality of a dog, it can become cowardly. And you need to achieve, that the dog executed commands with pleasure, instead of being afraid, that you will strike it. Commands should be said correctly, it is impossible to change or add commands to it other words. For example, the command to "lay", should not sound so "lay down" or «go lay down». The big attention give intonations of a voice, commands should sound confidently and accurately. And still there is the important moment, what training of puppy can do without punishment. Punishment should be carried out while the puppy has made undesirable action, is absolutely useless to punish for last tricks. Do not apply violence, and that the dog will see in you the offender. Training of puppies not such, therefore, if you feel easy work, that you can not cope with education of the puppy, entrust training of the friend to experts. Well, and if feel in itself forces, forward. 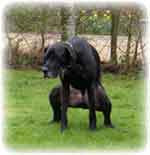 Puppy Training Over the Command to "Sit"
And still it is not necessary to forget about severity. So, to begin with it is necessary to find approaching for puppy training a place. It should be silent, without external irritants, it is better, if it is the acquaintance for a puppy. Then at it less temptations will distract. Also do not forget to take with itself any delicacy which is preferred by your pupil, for its encouragement. Well, the place is chosen, the delicacy is prepared., then – in a way, to comprehension of new commands! To begin with put a delicacy on a palm, is better to press its big finger. Then say a command to "Sit" (a command should be said accurately, easy, confidently), thus put a palm of a free hand on a waist more close to a croup and press a little, forcing a dog to sit down. The delicacy is better for bringing to a muzzle, but not to give yet. Only when the dog will sit down, it is necessary to praise it "well to sit" (besides to say accurately, easy), to stroke it and to award with a delicacy. 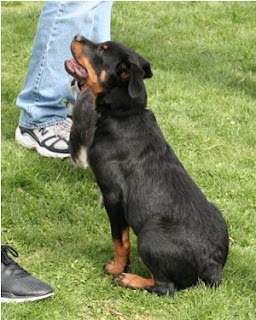 After command and encouragement performance let the dog will a little sit (approximately till 30 seconds), then you can release its command "walk". It is necessary to repeat the given exercise 3-4 times, thus doing having rummaged in 4-5 minutes. Your pupil has already started to execute the given command, but till the end of work on training of a puppy still far. Now you should achieve, that your dog executed this command, being from you on distance. For this purpose after performance of a command by a dog, start to depart from it for some time, leaving its sitting on a place. Gradually increase distance, since 1 metre. In an operating time over this exercise you should be always faced to a dog to see its actions and to correct errors if those appear. So, for example, if the dog tries to rise to run up to you or simply to replace a pose, make a step forward, simultaneously strictly submitting a command to "Sit". When the command will be correctly executed - the dog can be called up to itself a command "to me" or to approach most, to encourage with a delicacy, to praise it for correctly executed command (further encouragements with a delicacy to reduce, gradually absolutely having cleaned them). The given exercise should be repeated, gradually increasing time of performance of a command and distance from which she moves. It is possible to consider a command learnt, and exercise fulfilled if the dog implicitly executes a command on distance of 15 metres. But do not forget, that puppy training - is tiresome, it is impossible to overload an animal. Therefore carry out with it no more than 3-4 exercises for one walk. And do not forget to do between exercises breaks 10-15 minutes. Be patient and attentive to the pupil, and the result will not keep itself waiting. I think everyone love a puppy. They are cute, fluffy, and playful. However, don't let those innocent puppy eyes fool you - all puppies grow up to be dogs, and puppies growing up without the benefit of puppy training often grow up to be bad dogs. Here are some easy tips for puppy training to make the transition from puppy to dog easier on both of you. 1. Puppies grow up - act accordingly. Many puppy parents hold off on puppy training because, after all, they are just puppies. They think that puppy antics are incredibly cute. However, every time your puppy does something, remember how big your puppy will be as an adult. While a 10 pound lab puppy might be cute playing tug of war with your pant leg, chances are it won't be nearly as cute when your 100 pound adult lab does the same thing. Basic puppy training means setting guidelines about appropriate behavior from the first day home. 2. Make the crate a second home. Another part of puppy training is to give the puppy his or her own space. The easiest way to do this is with a crate. The crate provides the puppy a place to sleep, a place to keep the puppy safe when you are not around, and an easy way for you to travel. Puppies do not like to go to the bathroom where they sleep, so a crate can be a very useful tool when doing puppy house training. The crate should be large enough that your puppy can stand up, turn around, and lay down comfortably, but not so large that he or she can poop in one corner and lay down in another. Do not leave puppies in the crate for extended periods of time - a puppy can hold his or her bladder for about as many hours as it is months old. 3. Make puppy happy for coming. Getting puppy to come to you when called is one of the first puppy training steps that you should take. Doing this step of puppy training will have many uses - it will allow you to distract puppy from wrongful behaviors, it will allow you to find puppy if it becomes lost, and it can keep puppy from dangers activities like running into traffic. During puppy training, reward puppy every time he or she responds and comes when called. Small treats and lavish praises and pats will teach puppy that coming when called is a good thing. 4. Never hit a puppy. It is a common misconception that hitting a puppy is part of puppy training. However, hitting a puppy during puppy training more often than not will lead to only one of two things - a dog that is afraid of you or a dog that is aggressive. Neither is the desired result of puppy training, and this will lead to a dog that does not make a very good pet. 5. An integral part of puppy training is training your puppy the proper behavior around other dogs and people. Take puppy out often, exposing him or her to new situations and new people and pets. Reward the puppy for desired behavior, and reinforce simple commands like sit and stay. Remember to stay calm, as puppy will read your emotions and act accordingly. Starting puppy training early will lead to a lifetime of good times with your dog. Is your pet having trouble walking, getting up and down from high places? Are they scratching, and tearing up your furniture from falling off the couch trying to get up there? Many peop le may think it's strange that many pet owners cater to their pets and buy stairs for them to use. Most of them would say that they are just spoiling their pets, and ruining them by doing something so silly as to buy them stairs. Not only is it good for the pet's joints and health, but it's also good for the pet owners! Pet owners can use the pet stairs to let their pet climb in and out of their vehicles saving them the time and hassle of lifting their pets. It also saves from wear and tear on your furniture, and it is also good for your pet's health. They don't have to do any extra active work to overly exhaust their-self. Most veterinarians will recommend to pet owners of getting stairs for their pets that have had surgical procedures with sutures. It helps to prevent them from splitting the sutures open. Smaller pets like using the stairs as oppose to jumping up and down from high places. The stairs come in many varieties and styles. From stationary to portable, they come in different sizes to help ease with the different heights of furniture. You are bound to find one that is right for you and your best-friend. You can purchase them from any pet store, or you can go online to find one that will compliment your homes door. 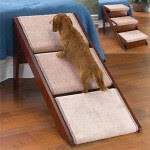 Pet owners often buy pet stairs to help ease the lives of their furry family members. Older pets may have trouble getting up and down, and using stairs gives them the advantage they need to sit or rest in their favorite spot without having to strain their joints. Remember the happier the pet is, the happier the owner is. It's a win-win situation for everyone. Not only will you ease your pet's suffering and aching joints, but you will save your suffering and aching back as well. So the next time you stop by the pet store to buy stairs. They will thank you for it many times over! It will probably be in the form of them showering you with their slobbering tongues and wet noses. In the majority of cases, potty training is done with puppies, but there are many dogs that have not learned when and where is OK to poop. Even with the popularity that housetraining had in recent years, a lot of people have not housetrained their puppies yet. Don't underestimate the confidence that having a housetrained dog can bring you, especially when you need to leave him alone. You can't potty train a puppy whenever you want to. He needs to be ready for it. Waiting for the appropriate time when he poops is probably the best moment to correct his behavior. When you see him do it, call him on it and invite him to go outside and finish. Making sure that you are using a low tone in your voice, give him the stop command. Next, begin to teach him about the "outside" command, guiding him slowly to a place where you're OK with him doing his needs on a regular basis. In some cases, you will see your puppy pooping inside the house, and you'll tell him to go outside and do it. If he doesn't react and continues to do it inside the house, it's because he doesn't know what you want from him, so it's not his fault. If you want him to obey your commands, be patient and take him outside yourself, teaching him that he needs to do it there. You can use a leash to improve your control of the pet. In most ca ses, people will see the effects of the accident only after it happened. When you see this, but didn't catch him in the act, it's better to ignore it and act on it next time that it happens. You shouldn't rub the puppy’s nose in it, because the lesson you teach him this way isn't the proper one. A better choice would be to bring the puppy to that area and take the poop while he's watching. That's because he will not understand why you're scolding him, even if only a few moments have passed since his action. Scolding the puppy while he's eating a bone will make him think that the bone is the reason you're upset. He will not be able to make the connection with the pooping he's done earlier. Talking with the puppy is best done by using commands, which makes puppy potty training much easier. What is important is how you teach him the meaning of the words. Since the puppy can't understand what you're saying unless he's trained, you need to teach him. If you want the best results possible in puppy potty training, your puppy should be taught well what each command means. An example would be teaching him that the word "outside" means that he should leave the house, and "go potty" that he should poop. Whether he does what you ask of him or not, punish or praise him, depending on what the results are. When you do this regularly, he will be conditioned to think that "outside" and "go potty" mean that he needs to do his needs.